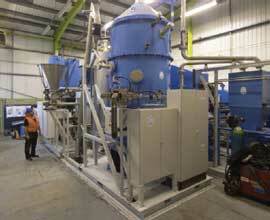 Today’s recycling innovations enable wastage to become an integral part of environmental solutions. 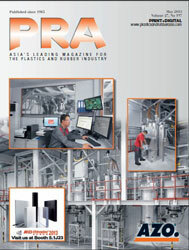 Featured are Dow’s latest compatibiliser for barrier films, a single-step process for recycling PC into PSU, a process for recycling landfilled plastic waste into hydrocarbon Plaxx, Erema’s Xtreme Renew recycling system for recycling rPET into preforms and Bühler’s latest sorting technology for rPET. Sailing competitors are all set to covet the win at the forthcoming Summer Olympics in August in Brazil. But the slew of rubbish could slow down or damage boats. While the raw sewage at Marina da Gloria has been cleaned up, out on Rio de Janeiro’s Guanabara Bay, sailors are still encountering rubbish like plastic bags. Certainly, Australian champion sailors, Mat Belcher and Will Ryan, would not want a repeat of the 2014 incident in Rio when a plastic bag had snagged on the foil of their dinghy. It almost cost them a gold medal when they dropped to last place after being forced to stop and clear the rubbish. They caught up enough places to secure the points to win gold, but it could have been disastrous. However, clean-up initiatives, are only winning part of the battle against marine pollution. A study by UK-based Ellen MacArthur Foundation finds that the more than 300 million tonnes of waste produced in 2014 could double over the next two decades. Today, waste gathered from clean-ups is no longer routed to dumpsites, and thanks to closed loop technologies for recycling, useful material is recovered, and most of it goes back to the manufacturing stream as virgin inputs. The US Environmental Protection Agency (EPA) Waste Reduction Model (WARM) says that an increase in recycling leads to a displacement of virgin sourced materials. Recycling common plastic types such as HDPE, PET and LDPE allows for as much as 90% of recovered materials. While efforts to recycle waste plastics are flourishing, it is important to note that not all waste plastics are easily recycled. The EMF report reveals that globally, only 10% of the plastic produced is recycled. One of the common materials that pose a challenge to recyclers is LDPE. The American Chemistry Council (ACC) explains that each of the resins used to produce films has unique properties that ideally should be preserved in the recycling process if film is going to be put to use in higher end applications. Meanwhile, PE flexible barrier packaging, containing polar polymers such as EVOH or polyamide, has posed unique recycling challenges due to the variety of materials generally used as part of its make-up. But that is set to change, according to Dow Chemical with its RecycleReady technology that enables recycling of multi-material, multi-layered pouches, flow wrappers, and barrier films. It incorporates Retain polymer modifiers, a key enabler/barrier compatibiliser for the recyclability of the packages, according to Dow. Created through a collaboration with the Sustainable Packaging Coalition (SPC) and other industry members, Dow says its technology helps converters create barrier pouches that answer consumer demand for more recyclable packaging options. 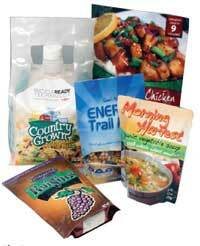 Additionally, these recyclable flexible pouches incorporate multiple layers, but use only PE as the basic raw material. In North America, the RecycleReady technology has been approved by the SPC’s How2Recycle programme, thus allowing for a way to create flexible packaging that can be easily recycled through existing PE film recycle streams, such as grocery store drop-off programs in the US and Canada. Every year, the world generates more than 2.7 million tonnes of polycarbonates, to create common household items, such as CDs, baby bottles, eyeglass lenses and smartphone screens. Over time, polycarbonates decompose and leach Bisphenol A (BPA), a chemical that in 2008 caused retailers to pull plastic baby bottles from store shelves due to concerns about the potential effects of BPA on the brain. Researchers at IBM Research’s facility in San Jose, US, have developed a single-step chemical process for recycling PC waste and transforming it into another type of plastic known as polyarylethersulphone (PSU). 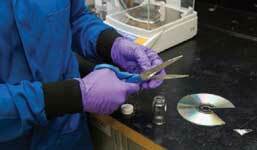 In the study, researchers added a fluoride reactant, a base (similar to baking powder) and heat to old CDs to produce PSU, featuring temperature and chemical resistance superior to the original substance. When the powder is reconstructed into new forms, its strength prevents the decomposition process that causes BPA leaching. Researchers also used a combination of predictive modelling and experimental lab work to make the discovery, and according to the research company, the learning from research efforts will also be used to advance cognitive systems to help accelerate the materials discovery process. PSUs are high-performance engineering thermoplastics that are commonly used for reverse osmosis and water purification membranes, medical equipment, as well as high temperature applications. 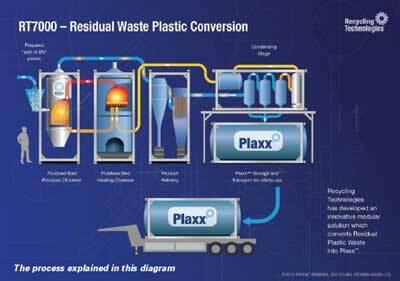 Meanwhile, UK-based Recycling Technologies (RT) has developed a process for recycling end-of-life plastic into Plaxx, a valuable, clean hydrocarbon product that can also be used as chemical feedstocks. The company was spun out from the University of Warwick in 2011. In early 2013, it opened R&D and production facilities in Swindon to develop and manufacture the WarwickFBR, its patented modular recycling unit. Thereafter, it made its flagship machine, the RT7000, which utilises the WarwickFBR fluidised bed reactor, and has the ability to process up to 7,000 tonnes of waste, converting it into 5,200 tonnes of Plaxx. The RT7000 is sized to allow it to be located at sites with residual plastic waste, for example a Material Recovery Facility. This distributed approach removes the need for costly transportation to centralised facilities, says RT. Solid at room temperature, Plaxx is easily transported for multiple uses. RT has teamed up with engineering consultancy Ricardo to assess the performance of Plaxx’s use as a chemical feedstock, paraffin wax, or as a clean and more sustainable fuel substitute for fossil-based heavy fuel oil (HFO) for heating, power generation or marine propulsion. The company funded its R&D projects through various government funding organisations, including the Knowledge Transfer Partnerships (KTP) and the Energy Catalyst grant with the University of West England (UWE), funded by Innovate UK; with additional support from other government funding organisations, such as the Department of Energy and Climate Change (DECC) and the Department for Business Innovation and Skills. Due to the current low oil price, PET recycling is not profitable at the moment. Thus, in collaboration with Italian packaging solutions provider Sipa, Austrian recycling machinery maker Erema has introduced the Xtreme Renew recycling system, which enables direct processing of washed PET flakes to produce preforms. 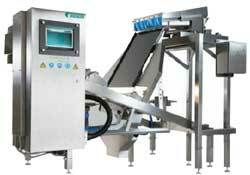 The melt is then fed to Sipa’s Xtreme preform injection compression moulding system, which was introduced at K2013. It thus, makes preforms in a single step. Erema says some 1.2 million tonnes/year of PET products are already recycled around the world with its Vacurema technology for end products such as preforms for the beverage industry as well as for thermoforming sheet, fibres and strapping. 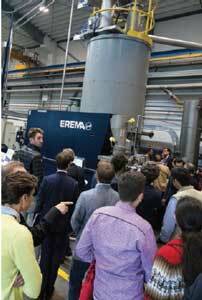 The claim of adaptability applies likewise to Erema’s MRS system, which can be retrofitted to existing extrusion lines. 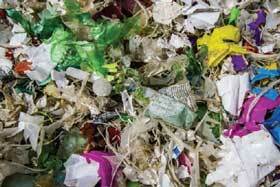 As a result, Vacurema technology offers a high degree of flexibility in PET recycling, which is enhanced further through the successful collaboration between Erema and Sipa, say the firms. Meanwhile, removing same-colour polymer material from clear rPET flakes, such as clear PVC, PE and PP, has been a challenge for recyclers, as these resins cannot be visibly distinguished at such high processing speeds, without losing a lot of valuable flakes. Adding to this complexity, rPET flakes can be minute. Swiss family-owned company Bühler has introduced the Sortex E PolyVision technology that is able to identify same-colour polymer contaminants in rPET, by analysing their chemical signatures. It features a new, patent-pending lighting system, which uses optimum wavelengths for detection, as well as high definition colour cameras and ejectors to remove the flakes. It can also be used as a three-in-one sorter or combined with existing Sortex technologies, in a fully integrated sorting station, according to Bühler. Also, the new equipment uses both transparent and reflective sorting methods simultaneously, reducing the contamination to below industry standards of 50 parts per million, says Bühler. The firm adds that its new equipment will enable recyclers to provide rPET flakes for high-end specifications, such as the packaging industry and the automotive industry, where the emphasis is on achieving the lowest contamination, measured in parts per million. The state restrictions imposed by Maine, Illinois and Minnesota states were in response to production of plastic cans in the 1980s and their negative impact on the recycling process. These laws remain in effect today, and have led many companies to withdraw support of this type of container, says APR. APR added that although the PET portion of the can may be recyclable, the metal lid is seamed onto the PET. There are no practical solutions to separate the two materials in MRFs, rendering the entire container nonrecyclable. APR says it has created laboratory test methods used to assess the impact of new innovations to the recycling market as an integral part of the APR's Champions for Change programme. Companies use these tests to confirm their innovations do not interfere with recycling. Once testing requirements are met, those companies receive APR Critical Guidance Recognition. This process addresses the challenge of introducing packaging that is consistent with recycling technology, and APR encourages plastic can producers’ participation. 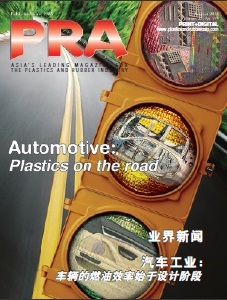 “As the voice of Plastics Recycling, APR strives to solve industry challenges,” commented John Standish, APR Technical Director. “Because the plastic can is a significant contaminant to the plastic recycling stream, we encourage their producers to collaborate with APR to design packaging that is recyclable and sustainable,” he said.